I am determined to have some balance in my life, but it would really help if there were a couple more hours in the day. Or perhaps there are plenty of hours, but if I could stay awake for more of them–maybe that would help? That’s not going to happen. Lots of interior design work lately. 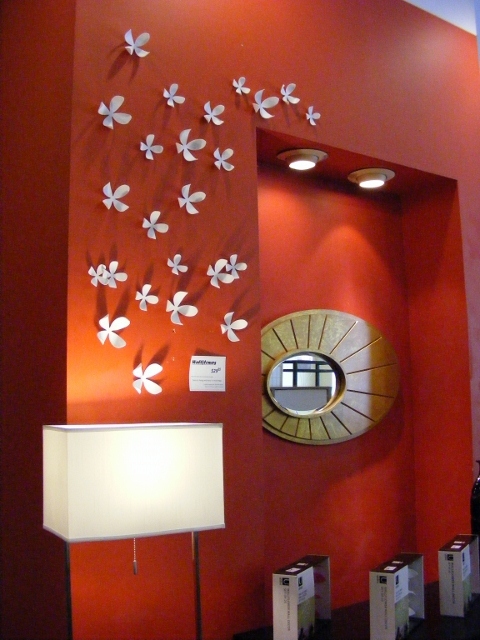 The Design Direction option offered by DeCocco Design works well for many people. Sometimes it morphs into more, so then I’m on a bigger job. Sometimes clients don’t need that much help and it shrinks into an hourly job. All are good by me. I continue to meet the nicest people, who love their homes and families and want their spaces to work well for them. 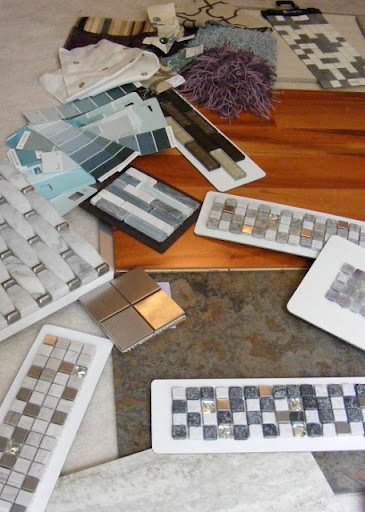 So I’ve been choosing colors, cabinets, tiles, light fixtures, etc. all over town, as well as sourcing online and writing endless reports. Oh! And now DeCocco Design takes credit cards and Paypal. Very handy! Should I be showing you this? When I’ve collected all kinds of samples for a job and am ready to make decisions, I lay it out on the floor in my office, in front of a big window. What a mess! But that way I can see how everything relates and, in the end, it all comes together nicely. But it has to start out looking like this! I’m not even showing you all of it. Personally, I love this part. The pieces all meet each other and definitely start to form cliques. Sometimes I have to step in to make everyone behave and introduce new possibilites. I haven’t done a Find of the Week lately, so here’s one I found weeks ago. It’s in Ecko on Glenwood Ave., here in Raleigh. See those 3D flowers? They’re made of some sort of plasticy material, with a matte finish (looks good). You get all the flowers you see here for $30 and what a FUN idea for so many spots in a house! Kids room, for sure. High on the wall and onto the ceiling in a powder room. Behind a chair with a lamp shining up on them, as you see here, etc. I’ll bet you could embellish them if you wanted to, but I like the simple color. They could look rather sophisticated or they can just be fun. Love them! I also like that lamp, but that’s another topic for another day. 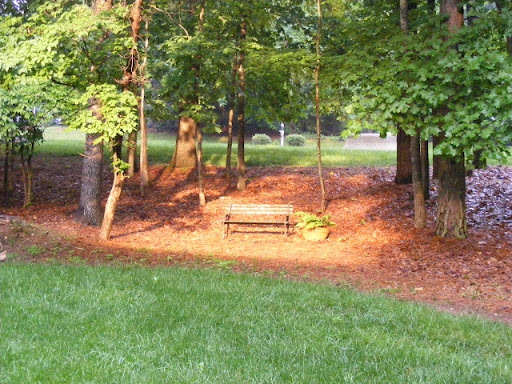 The sun had broken through and was just shining down in one spot in our yard–on this bench. My mom gave us this bench as a housewarming gift for our very first house, over 25 years ago and it has followed us to every subsequent house (and there have been quite a few). The bench is now very fragile and covered with great, crusty, growing stuff and Mom has been gone for over 7 years. Seeing the sun shine on that bench felt like a message from her that all was well. It felt great. Oh my gosh, I have been rambling! Will try to get back to more regular, shorter posts. I hope you know that in your life, too, all is well.